Cities, like dreams are made of desires and fears, even if the thread of their discourse is secret, their rules are absurd, their perspectives deceitful, and everything conceals something else. It feels to me as if I’ve always known Italo Calvino’s Invisible Cities. As if my brain were born and instantly had Invisible Cities in its matter to refer to. But that wasn’t the order of things. Pippi Longstocking came first and then someone—probably my friend Yates who came from a family of architects, artists, and readers—pressed it on me for the first time. And someone else in college—my professor of post-War Italian Literature, or my professor of Italian feminist theory—made me read it. Whereupon I chose to devote an entire semester to studying it. I remember feeling like the calligrapher to the perverts trying to execute a coherent thesis in my remedial Italian about one of the most complex crystal literary structures ever written. Yet, there is a point of origin in my consciousness, Invisible Cities came to me precisely when I was ready to read it, when my mind was blasted open to complexity and patterns—after which the world and my memory of it dissolves into a series of visual, theoretical and mathematical illustrations of Calvino’s masterpiece. So that: There isn’t a city on a river that isn’t split in two, twice; two parts on either side of the water and two parts on either side of the water’s reflection. There isn’t a massive tangled city center that doesn’t seduce its residents into its heart, feed upon their life force. There isn’t a city not made of dreams—and over time, broken dreams. No city that isn’t a ghost sooner or later, and throughout its web of streets haunted by a single fleeing spirit. There is no unconquered city; they are all colonies. There are no cities that don’t envy others; no populations who aren’t desperate to have at least one something completely different. There are no storytellers who aren’t Marco Polo recounting farflung adventures to an imperial Kublai Khan. Nor are there listeners who don’t stop listening in order to weave their own synchronistic narrative—a second independent strand of thought, running alongside the first, reflecting and interacting, vying for dominance. Calvino’s fiction isn’t a story; it’s an ordering and reordering of the emotional and philosophical reverberations of our civilized world, our human condition. 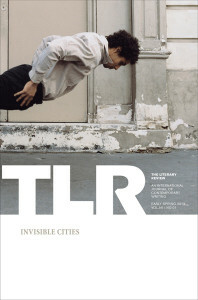 The book itself is extremely formal—each chapter is a prose poem describing a city. Each city has variations. Cities are grouped into categories according to random patterns. Each city is imagined; each city is conceptual. Every interlude between Khan and Marco Polo is a thought experiment about powerful structures—empires, governments, languages, lands, tales. And the intelligence behind the entire construction is singular. We have not tried here to mimic the original. With the polyphony of writing gathered, I’m barely sure we’re referencing it. Our Invisible Cities satisfies itself by occupying the reverberation. Our stories and poems are our cities and they issue in many respects from Calvino’s meticulous categories: desire, memory, signs, the eyes, the names, the dead. Some of the work is extremely formal—with precision edges and self-contained references—and some of it is so organic it dampens the page with its dew, heat, and flora. If there’s a tribute to Calvino here, it’s noisy and free form—more wake than memorial. La Chute, meaning “The Fall,” is a stomach-churning, tingling series of photographs by Parisian photographer Denis Darzacq that captures ordinary people in familiar, urban settings and still manages to force the viewer to the edge of his seat. Seeing a man, one you might have passed a thousand times on the streets of your own city without taking a second glance, suspended in mid-air above a dingy sidewalk, makes us question the nature of the everyday. He hangs, just close enough to the ground to make us worry about how he will land, and just far enough in the air to put the seed of doubt in our minds as to whether or not he needs to. The fact that Darzacq refused to use digital manipulation in creating this series makes the product even stranger and more enthralling. Darzacq uses this series to “questions the place of the individual in the city,” a daring endeavor, considering how easily an individual can be reduced to a subway schedule, a paycheck, square footage, or a carbon footprint in an urban ecosystem. These photographs examine cities as humanity’s petri dishes, crucibles where human organisms are heated and spun and smashed together until their base nature is laid bare. Cities have been called aggressive places, but they might be better described as raw. Darzacq captures this pathos and then subverts it, likening the subjects of his photographs to “modern-day knights who can combine disciplined work and play, the laws of gravity and weightlessness.” He uses photography “to build between two realities,” drawing our attention to the empty space. The work creates a sense of magical realism and amazement that borders on the uncomfortable, as we are made to wonder about the invisible in these cities. Just when we’re sure we are going to break our noses on the cold concrete. Darzacq’s work considers the possibility that we could fly. Gloria Beth Amodeo (books) is a graduate of The New School’s MFA creative writing program and the winner of the 2011 H.O.W. Journal Fiction Contest. Her work has appeared in H.O.W. NOW, NY _____., and Carrier Pigeon. She is currently cofounder/contributing writer for Mantaster.com. Erica Anzalone’s (poetry) first book, Samsara, is the winner of the 2011 Noemi Press Poetry Prize. She is book review editor of the literary magazine Interim. Renée Ashley (books) is poetry editor of The Literary Review. Chris Arthur (“How’s the Enemy?”) is author of five essay collections, most recently On the Shoreline of Knowledge. His work has appeared in a range of journals, including The American Scholar, Irish Pages, Northwest Review, Orion, Southern Humanities Review, Southwest Review, and the Threepenny Review. His essay “(En)Trance,” first published in The Literary Review, was selected for Best American Essays 2009. Steve Barbaro’s poems appear in such journals as Conjunctions, American Letters & Commentary, Washington Square, Caketrain, and Denver Quarterly. He lives near Chicago and is currently writing a novel about paranoia and crowd behavior. Eric Barnes (“Perfection”) is the author of the novels Shimmer, an IndieNext Pick, and the forthcoming Something Pretty, Something Beautiful, along with numerous short stories published in Prairie Schooner, Best American Mystery Stories 2011, and other publications. By day, he is publisher of three newspapers covering business and politics in Memphis and Nashville. Dan Beachy-Quick (books) is the co-author, most recently, of two collaborations: Work From Memory (with Matthew Goulish) and Conversities (with Srikanth Reddy). A study of John Keats, A Brighter Word Than Bright, and a novel, An Impenetrable Screen of Purest Sky, will be published in the fall. He teaches in the MFA program at Colorado State University. Lucy Biederman (poetry) lives in Lafayette, LA, where she is a doctoral student in English Literature/Creative Writing at the University of Louisiana. She is the author of The Other World and has poems forthcoming in Handsome, SCUD, Bone Bouquet, RHINO, and others. Josh Billings (books) is a writer and translator who lives in Portland, ME. His translations of Alexander Pushkin’s Tales of Belkin and Alexander Kuprin’s The Duel are available from Melville House Books. Amy Bonnaffons (“A Room To Live In”) lives in Brooklyn, NY. She teaches writing at New York University and is at work on a novel. Weston Cutter (poetry) is from Minnesota and is the author of All Black Everything and You’d Be a Stranger, Too. Kelly Easton (“Shapeshifters”) is the author of several novels for children and young adults, such as Hiroshima Dreams; The Outlandish Adventures of Liberty Aimes; and The Life History of a Star. Awards include the Asian/Pacific American Literature Award, and the Golden Kite Honor Award. She is on the faculty at Hamline University’s MFA in Writing for Children and Young Adults. Her particular interest is writing in clinical settings. Lexi Freiman (“Insemination”) is Australian. She worked as an actor for Australia’s national Shakespeare company and in New York she works as an editor. She has an MFA from Columbia, and this is her first published story. Angel Igov (“A Short Tale of Shame”) is a Bulgarian writer, literary critic, and translator. He has published two collections of short stories, and his first collection won the Southern Spring award for debuts in fiction. Igov has also translated books by Paul Auster, Martin Amis, Angela Carter, and Ian McEwan into Bulgarian. He is currently getting his Ph.D. in European Literature. John Kinsella’s (“Flying Fish (counterpoint)”) most recent volume of poetry is Jam Tree Gully. He is also author of the critical book Activist Poetics: Anarchy in the Avon Valley. He is a professional research fellow at the University of Western Australia. Brett Fletcher Lauer (poetry) is the deputy director of the Poetry Society of America and poetry editor at A Public Space. His first book, A Hotel In Belgium, is forthcoming from Four Way Books in 2014. Jane Lewty (poetry) is the author of Bravura Cool, which won the 1913 First Book Prize in 2011. She is a professor of English literature and creative writing at the University of Amsterdam. W.M. Lobko’s poems, interviews, and reviews have appeared in journals such as Hunger Mountain, Slice, and Boston Review. New work is forthcoming from Seneca Review, Grist, and The Paris-American. He is a founding editor of TUBA, a new review of poetry and art. He currently teaches in New York, where work on his poetry and his novel The Quick Brown Fox doggedly continues. Stephen Longfellow (poetry) presently lives over a junk shop in Wabasha, MN, where he spends way too much time gazing out his window at the Mississippi. Andrew McKay (last words) serves as director of advancement communications for Fairleigh Dickinson University. He is currently working on a memoir titled Living Here, which chronicles his experiences growing up in a New Jersey floodplain in the early 1980s. Michael Miller (books) is an editor at Bookforum magazine, and is an advisory editor to The Literary Review. Kate Munning (books) is managing editor for The Literary Review. When not writing for outfits like The Rumpus and Bookslut, she inhabits her alter ego as a trowel ninja and ambitious cook. Her garden is bigger than her house. Collier Nogues’ (poetry) first book is On the Other Side, Blue. She has received fellowships and grants from the MacDowell Colony, the Ucross Foundation, Vermont Studio Center, and Oregon’s Fishtrap, Inc. Currently, she teaches writing at the University of California, Irvine, and lives in nearby Long Beach. Sarah Rose Nordgren’s poems have recently appeared or are forthcoming in The Iowa Review, Pleiades, The Harvard Review, Poetry Northwest, the Best New Poets 2011 anthology, and elsewhere. Winner of the 2012 James Wright Poetry Award from Mid-American Review and two-time fellowship recipient from the Fine Arts Work Center in Provincetown, Sarah Rose grew up in Durham, NC and teaches at Miami University of Ohio in Middletown. Geoffrey Nutter (poetry) was born in Sacramento, CA and studied in San Francisco and Iowa. He is the author of A Summer Evening, Water’s Leaves & Other Poems, Christopher Sunset, and The Rose of January. He has taught at The New School, New York University, Columbia, and the Iowa Writers’ Workshop. He lives in the Heights of Manhattan. Stephen O’Connor (“Ghost”) is the author, most recently, of Here Comes Another Lesson, a collection of short fiction, as well as Rescue. He has also written two works of nonfiction: Will My Name Be Shouted Out?, a memoir; and Orphan Trains: The Story of Charles Loring Brace and the Children He Saved and Failed, biography/history. His fiction and poetry have appeared in The New Yorker, The Missouri Review, Poetry Magazine, Electric Literature, and Black Clock, among many other places. His essays and journalism have been published in The New York Times, The Nation, AGNI, The Boston Globe, and elsewhere. Douglas Ramspeck (“Crow”) is the author of four poetry collections. His most recent book, Mechanical Fireflies, received the Barrow Street Press Poetry Prize. His first book, Black Tupelo Country, received the John Ciardi Prize for Poetry. His poems have appeared in Slate, The Kenyon Review, The Georgia Review, The Southern Review, Alaska Quarterly Review, and AGNI. He is the recipient of an Ohio Arts Council Individual Excellence Award. He teaches creative writing and directs the Writing Center at The Ohio State University at Lima. Angela Rodel (translation) is the translator of The Apocalypse Comes at 6 pm by Georgi Gospodinov, Party Headquarters by Georgi Tenev, Thrown into Nature by Milen Ruskov, and 18% Gray by Zachary Karabashliev. She was awarded a 2010 PEN Translation Fund Grant for her translation of several stories from Tenev’s Holy Light. Benjamin Sutton (poetry) is the winner of the Kay Murphy Prize in Poetry awarded by the University of New Orleans and Bayou Magazine. His poems have recently appeared or are forthcoming in Quarterly West, Sycamore Review, Third Coast, Barrow Street, and Washington Square, among others. Leon Weinmann (poetry) has published poetry in numerous journals, including The Antioch Review, Boston Review, Third Coast, Mimesis, and Blackbird. He has just finished his first manuscript of poems, Exercises with Fermata, and is currently working on a book of essays about life in contemporary Rome. Theodore Worozbyt’s work (poetry) has appeared or is forthcoming in Antioch Review, Best American Poetry, Crazyhorse, The Iowa Review, The Mississippi Review 30 Year Anthology, New England Review, Po&sie, Poetry, and Shenandoah, among others. He has published two books of poetry, The Dauber Wings and Letters of Transit, which won the 2007 Juniper Prize. Rachel Zucker (poetry) is the author of four books of poetry, most recently Museum of Accidents. She teaches at NYU and the 92nd Street Y and is the recipient of an NEA fellowship. She lives in New York City with her husband and their three sons.